This lecture exclusively talks about Deaf Child. Firstly, in section one, the educator has put forward an overview about a deaf child followed by a particular mention about its Aetiology. Moving forward, the educator has given a thorough explanation of the Prenatal Causes. 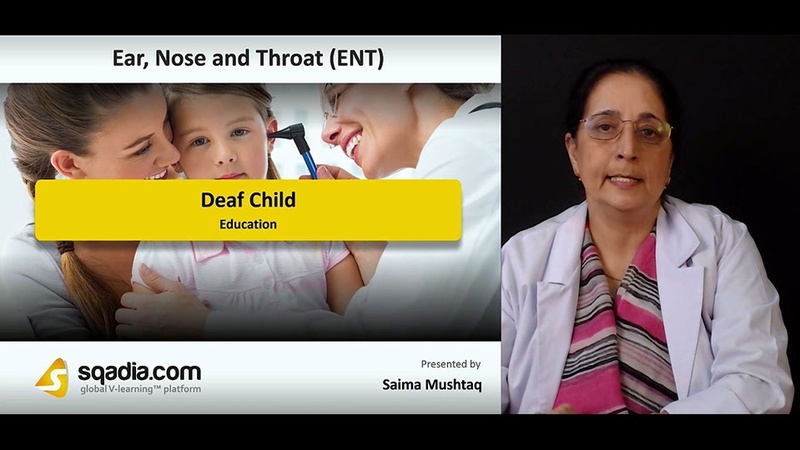 Next in line, the educator has comprehensively talked about numerous Syndromes Associated with Hearing Loss. Afterwards, the educator has demonstrated the Perinatal Causes. At the end of this section, light has been shed on the Postnatal Causes. The major focus of section two is on the Evaluation. The educator started off by reporting about the Evaluation of Deaf Child succeeded by a list of Risk Factors for Hearing Loss in Children. In addition to this, the educator has also conversed about the Assessment of Hearing in Infants and Children. Later on, various Screening Procedures have been addressed. The educator then concludes by shedding light on Behaviour Observation Audiometry and certain Distraction Techniques. Section four accommodates Conditioning and Objective Tests. The educator commences by mentioning a range of Conditioning Techniques. Moving forward, the educator describes the Objective Tests followed by a discussion on the Otoacoustic Emissions. The curtains are brought down when the educator talks about Impedance Audiometry. Section four aims at discussing about the Management. In the beginning, the educator demonstrates about Management along with Parental Guidance. Besides this, the educator has elaborately explained certain Hearing Aids along with Cochlear Implants. Moving further, Development of Speech and Language has also been reported. Ultimately, the educator has winded up by talking about Auditory-Oral Communication. The focal point of section five is Education. Firstly, the educator describes about the Manual Communication followed by Total Communication. Later on, the educator has spoken about the Education of Deaf. This section comes to an end, when the educator talks about Vocational Guidance.